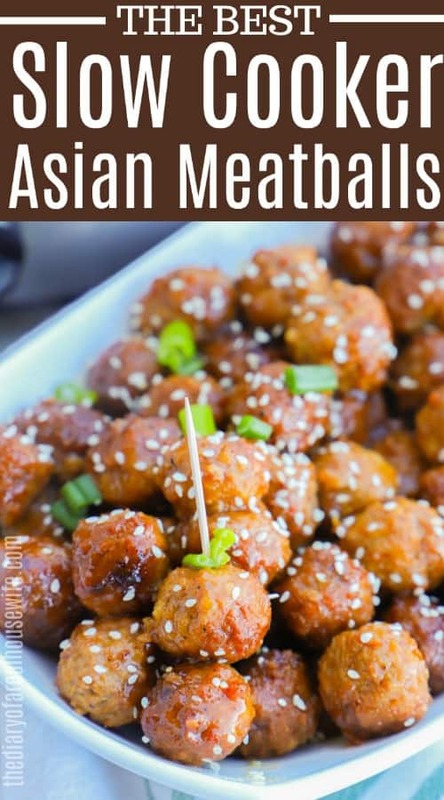 These Slow Cooker Asian Meatballs make the perfect appetizer or dinner recipe. Everyone in my family loved this recipe! It’s so simple to make, just add the ingredients to your slow cooker and walk away until dinner time. Who doesn’t love a good meatball? My kids love them, my husband loves them, and I love them. 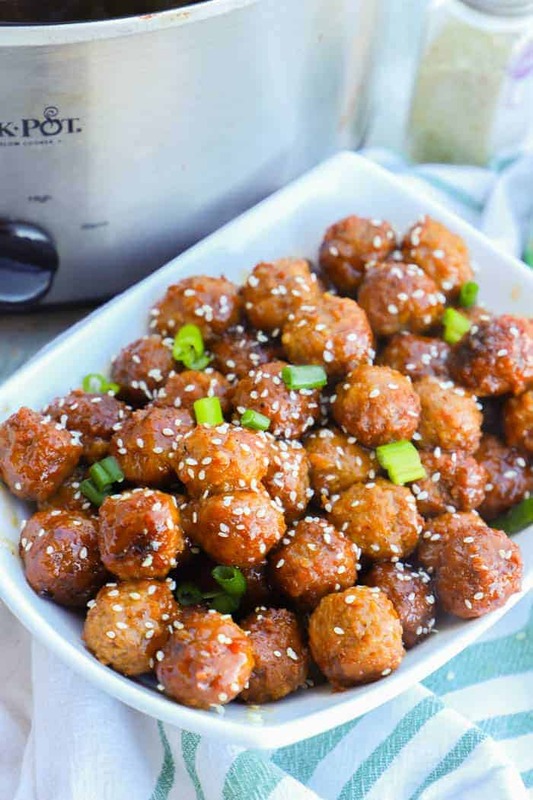 These Slow Cooker Asian Meatballs not only make the perfect dinner but also the perfect party appetizer. If you are serving them at a party just leave them in the slow cooker on warm and grab some toothpicks. If you serve them for dinner try them over a bed of rice and on the side my recipe for garlic Asian green beans. Step one: Place frozen meatballs in your slow cooker. Step two: In a small mixing bowl whisk together remaining ingredients. Step three: Once those ingredients are well combined you can pour it over your meatballs and toss to coat. Step four: Cook on high for 2-3 hours or on low for 4-5 hours. When serving I garnished my meatballs with sesame seeds and diced green onions. Of course, you don’t have to use frozen meatballs. I find that they work well and cook quicker. If you would rather homemade meatballs you would need to use a few less to make sure they don’t overcrowd your slow cooker and smush together when cooking. Place frozen meatballs in your slow cooker. Whisk together remaining ingredients. 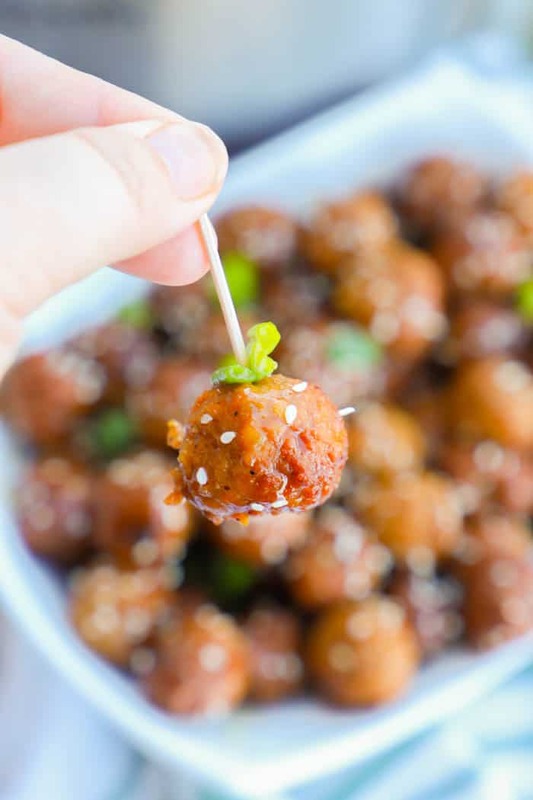 Pour over meatballs and mix until meatballs are coated. Optional: I garnished mine with sesame seeds and diced green onions.